You will be given a reference e-book to read which has 460 pages And the test will be based on that e-book , you can take final test within 1 year of purchase. Encryption. It refers to a set of mathematical formulas and techniques that are used in encoding, hiding and creating unreadable network communications and files. It is also concerned about hiding the sender’s identity so the anonymous remailers strategy is a part of this category. Authentication. This is used in verifying if a user is exactly who they claim to be. This is a huge help in preventing spy, fraudster and imposter from accessing your system. One of the most effective authentication techniques that you can use is the password system. Firewall. This refers to network packet filters that you can use in obstructing unwanted network traffic. This works in protecting your system against internet worms and crackers. Other useful Linux security techniques and tools are spam filters, intrusion detection systems, and virtual machines. If you want to become a knowledgeable and skillful Linux security expert, then it is advisable for you to take part in the Linux security certification program which is now available at Brainmeasures. The Linux security course offered by this online certification company is developed by real Linux security experts and this guarantees you that you will receive the most comprehensive and accurate information upon deciding to enroll in it. If you enroll in this certification course, expect to undergo a well-detailed and impressive Linux security training which covers all the aspects linked to Linux security including the threats, vulnerabilities and risks that are usually faced by Linux systems, the many Linux security tools and techniques that you can use in dealing with them and the things that you can do to maintain the excellent condition and performance of your system. Receiving your Linux security certificate is rewarding because it can boost your confidence especially once you start to perform tasks that are related to securing your Linux system. How to build a more secure kernel? How to effectively secure and configure network services? How to protect your system against well-known attacks? 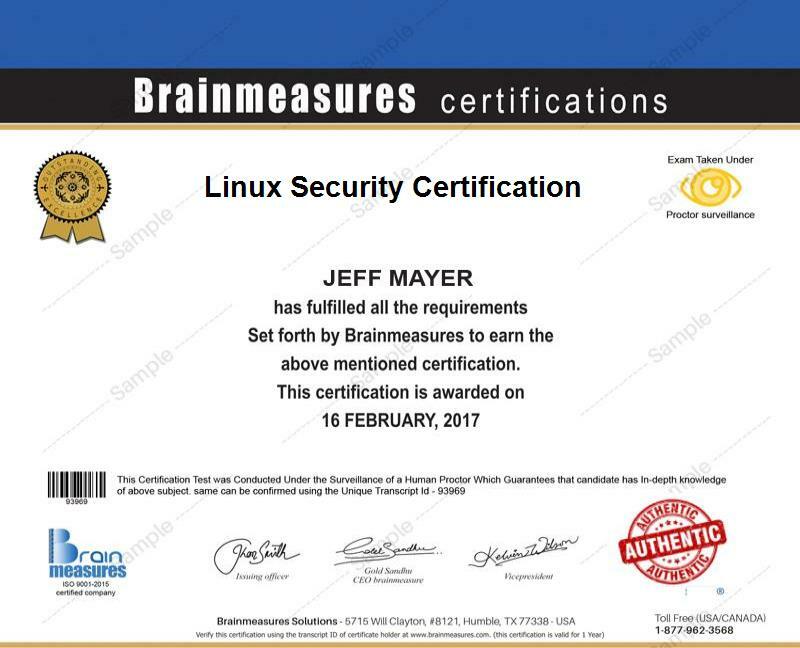 The proven comprehensiveness of the Linux security certification program from Brainmeasures is an indication that it offers numerous benefits to a lot of people. You can expect this certification course to work more effectively for security experts, system architects, program managers, Linux developers, network and system administrators and any other individuals and professionals who wish to gather more information about the basics of protecting, configuring and maintaining the good condition of a Linux system. Your Linux security certification is also your ticket towards accessing jobs that offer a highly profitable pay. With the help of your Linux security certification course, you will have an easier time getting the position of a Linux system administrator which offers an annual salary within the range of $78,000 to $105,000. Working as a Linux security specialist is also financially rewarding because this profession offers a salary of around $89,000 to $126,000 per year.